At FAIR a variety of experiments with antiprotons is foreseen. Since antimatter annihilates immediately when coming to contact with ordinary matter, it is not possible, to produce a primary antimatter beam. Instead of that proton-antiproton pairs will be produced in collisions of highly energetic protons (E = 29 GeV) with a metal target. By means of a “magnetic horn” the antiprotons will be focused directly after the production target. To achieve this, it is required to pulse the horn with a current of 400 000 A. 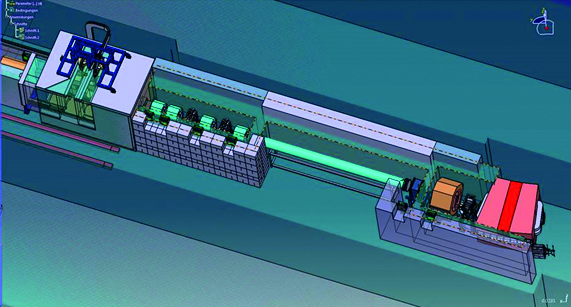 In the succeeding antiproton separator, a roughly 100 m long beamline with an extremely high acceptance, the secondary beam of antiprotons will be separated from the primary proton beam as well as from secondary beams of other particle species and will be transported to the collector ring. Depicted is the antiproton target station (on the left), an iron shielding with a thickness of about 1 m, which contains the production target and the magnetic horn, and the first 25 m of the antiproton separator.